MISSISSAUGA, ON, Sept. 24, 2018 /CNW/ – Following the unprecedented successes of M City’s first two towers, M1 and M2, today Edward Rogers, Mayor Bonnie Crombie and the M City team unveiled plans for a third tower along the western edge of Mississauga’s emerging downtown. Designed by acclaimed Canadian firm IBI Group, M3 will soar to 81 stories, making it the tallest tower in Mississauga by a significant margin, and one of the tallest buildings in the GTA. The tower’s verticality is enhanced by a dynamic faÃ§ade defined by saw tooth balconies that create a black and white diagonal pattern up the building, providing scale, texture and materiality. “The tower form is crowned by a sloped and stepped top that complements the diagonal balcony pattern and creates incredible terrace units, giving residents an opportunity to experience the city like never before,” says Kazerouni. Fronting onto Burnhamthorpe, M3 will provide unfettered access to abundant green spaces with M City’s expansive two-acre parkland abutting the podium. A wraparound cafÃ© on the ground level along with a linear park on the tower’s north east side, will activate a public realm in and around the site. The building’s unique design allows for an extensive amenity pavilion that includes an indoor pool and gymnasium, providing one-of-a-kind views of the neighbouring park. 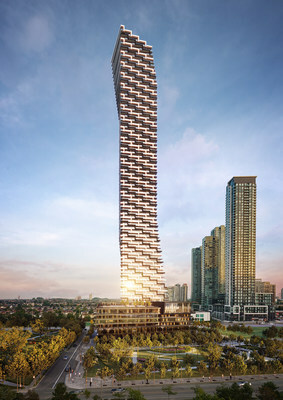 M3 is Mississauga’s tallest tower at 81 storeys, with 900 units ranging from 480 sq.ft. to 1,000 sq. ft. Register online at mcitycondos.com.